I have quite a few ebooks in various formats, mostly PDF and CHM. Some time ago I noticed that an update from Microsoft limited the ability to open CHM files. I had previously researched how to fix this but after a recent reinstall of Windows I've found myself with the same issue as before. I had forgotten how to fix it. I also noticed that the fix isn't very easy to find. So, I thought I'd post it here for anyone who may run into the same issue. You will see an error like "Navigation to the webpage was canceled." This was actually a security feature Microsoft added. Intranet and internet downloaded CHM files are blocked by default. There are a few ways to fix this, we'll start with the least preferred. This registry hack will enable CHM files to open remotely or locally. This is quick and painless but could lead to security risks, though I've never heard of anyone getting hacked or acquiring a virus from a CHM file. At any rate, use that registry hack at your own risk. To install it, simply download the .reg file, right-click it, and choose install. The next way is probably the easiest but it requires that all CHM files be downloaded to the local machine. This, to me, is not a problem. This will unblock all local CHM files and it's an obvious fix that just elluded me for some reason. 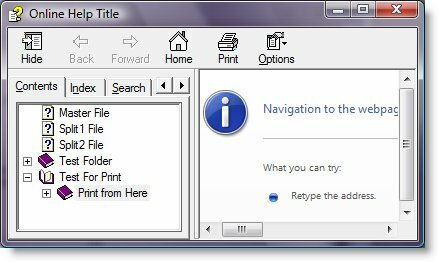 When the CHM file is clicked a dialog box appears with a checkbox that says "Always ask before opening this file type". According to Microsoft, unchecking this box will unblock all the CHM files that are on the local machine. I've not tried this method, however. The final method was the one I used. It is simply to unblock the files individually. I was unaware that there was and "unblock" button inside the properties menu for the file. Simply right-click the file, choose properties, and in the "General" tab there should be an Unblock button at the bottom. Simply click this button and the CHM file should open and display correctly.